Dawn Phillips struggled academically before transferring to Oregon State University. She knew the program she’d chosen — Nutrition and Dietetics in the College of Public Health and Human Sciences — would be difficult, but she was not deterred. Phillips dove into the program head first, joining the Nutrition and Dietetics Club and working in a student position at the Moore Family Center for Whole Grain Foods, Nutrition and Preventive Health. She hasn’t looked back. Phillips has earned her success because it didn’t come easily. As a teenager growing up in Alaska, her family went through hard times, and Phillips ended up on her own at 15. 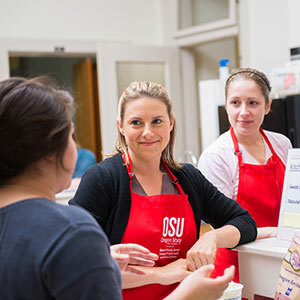 After graduation, Dawn Phillips, center, will begin the Oregon State Dietetic Internship, the last step before taking the exams to become a registered dietitian. Phillips worked full-time service jobs for a while before she was able to attend school. She studied interior design for a year at Portland Community College, but it was clear that wasn’t the right path either, so she took time off to explore her options. It was around this time, at age 19, that Philips decided to lose weight and get healthy. She found women’s magazines and popular weight-loss books confusing. “There were all these different ways to do this, but I wanted to know the real answers,” she says. She found those answers by learning about nutrition. 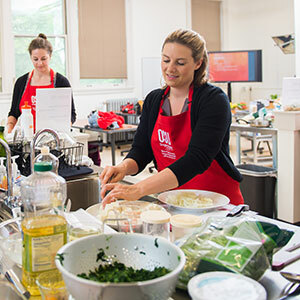 At Oregon State, Phillips shares the healthy habits she began in her early 20s with undergraduate students by teaching cooking classes at the Moore Family Center. She teaches easy recipes that help students develop confidence in the kitchen. “When people tell me, ‘Oh, I love this recipe,’ or ‘I’m going to make this at home,’ I feel like the class is working,” she says. This summer, Phillips will continue her job at the Moore Family Center, teaching cooking classes to a younger audience as part of the KidSpirit Program for youth in grades K-12. In the fall, she will begin the Oregon State Dietetic Internship, the last step necessary before she sits for the examination for registered dietitians. Phillips is excited for the next chapter and thrilled to have the support of her community at Oregon State — as well as from her family.